Lodewijk Toeput (Lodovico Pozzoserrato, Pozzo da Treviso), Flemish painter and draughtsman, active in Italy. He was apparently a pupil of Marten de Vos and went to Italy probably after 1573. In Venice he presumably joined Tintoretto s workshop. Toeput may have witnessed the event he commemorated in his Fire in the Doge s Palace (1577; Treviso, Museo Civico Bailo). Either before or after this commission, he made six landscape frescoes (c. 1575 or 1577-79) for the abbey of Praglia, which reveal a strong adherence to Flemish conventions. Some years later he painted three frescoes in the church of S Giustina in Padua. He was in Florence in the late 1570s and visited Rome in 1581; by February 1582 he is documented in Treviso, near Venice, where he settled. 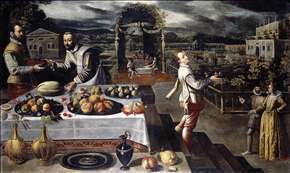 He remained in close contact with Venetian masters, particularly through another Flemish artist active there, Pauwels Franck (1540-96), whose influence is evident in Toeput s representation of the Four Seasons (c. 1584; private collection), of which two tondi versions exist, which are attributed to Toeput (e.g. Providence, Rhode Island School of Design Museum of Art, and private collection). Around 1585 he painted a friezelike series: two canvases (in situ), each with two biblical scenes, for the chapel of the Rettori in the church of the Monte di Pieta in Treviso. These compositions were inspired by Netherlandish engravings and works by Tintoretto and Jacopo and Leandro Bassano. Probably dating from the same time is Susanna and the Elders (private collection). One of Toeput s favourite motifs was a formal Mannerist garden containing trellises and sculptures, which he included in Dives and Lazarus (Kassel, Schloss Wilhelmshhe). It also appears in his versions of the Banquet in the Open Air (private collection) and in his Outdoor Concert. Only a few of Toeput s church paintings mentioned in early literature survive in Treviso, in the churches of S Leonardo, S Maria Maggiore and S Agostino; similarly the surviving frescoes are scarce and in a poor state of preservation. Around 1590 Toeput painted six landscapes representing The Months for the Villa Chiericati-Magna, Vicenza, and in 1593 he decorated the interior of the Scuola dei Battuti in nearby Conegliano with figures of sibyls and prophets and Old Testament scenes. See more details about "Banquet in a Formal Palace Garden"